Welcome back to another edition of Core Worlds Couture! This week, its a two-for-one-deal: a review and a jewelry tutorial! A few weeks ago, I was searching for some simple porg merch – namely a badge-pin to add to my ever-growing collection – and I ran across a re-tweeted post in Twitter from @My Squadron Goals. 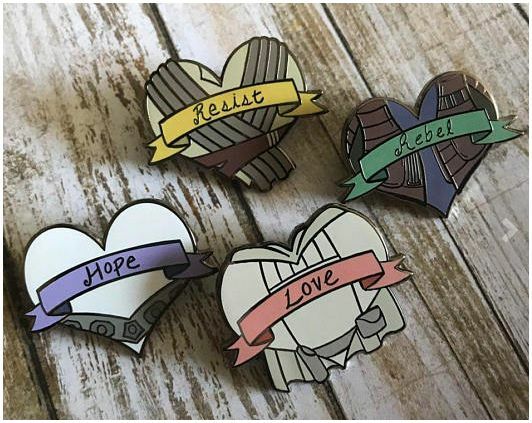 So, I clicked on over to the Etsy store (named Squadron Goals) to purchase the pin, and was greeted by an adorable arrangement of Star Wars goodies: enamel pins, phone charms, stickers, and bumper stickers. The shop owner, Courtney Morelock, was kind enough to agree to send me a few phone charms and pins, in addition to the porg badge-style pin I had purchased. As it turns out, Courtney is also one half of “Who Talks First,” a podcast she co-hosts with her friend, Solo. When the package arrived, I was beyond thrilled! The phone charms are acrylic, and measure in at roughly 2” in length. They are double-sided, and have a strap to attach to your phone. The colors are very vibrant. The Ahsoka charm is the same picture on both sides, but the Leia and Jyn charms feature a different “scene,” if you will: Leia is smiling on one side, focused and determined on the other; Jyn is seemingly in a meditation state on one side, a ghost on the other. The charms are also available in many of the Star Wars characters we know and love, as well as Overwatch and Final Fantasy characters as well. There’s even a Pikachu/BB-8 crossover charm (think: “Wrecking Ball”)! Charms are priced anywhere between $7.50 – $20.00 (for the Rey/Kylo twin set), plus S/H. The enamel pin I received is the Padmé “Love” pin, and it is very well-crafted,made of hard glazed enamel, and has dual prongs with rubber backs. The pins measure 1.5” in width, perfect for that con lanyard, lapel, or anywhere you want to display it. Cost is $11.00 ea., or $40.00 for the set of four, plus S/H. The badge pins are available in a 16 different characters, priced at $2.00 each, or you can get the whole set for $30.00 (plus S/H, of course)! I’m sure I’ll be purchasing more from Squadron Goals in the future! If you’re interested in learning more about Courtney, her products, and her podcast, listen for my interview with Courtney on a future episode of Starships, Sabers and Scoundrels! Because I don’t use phone charms as phone charms, I decided to get a little creative with them. First up: a button/zipper bracelet, featuring the Askoka charm. I have made several of these bracelets, and they always garner lots of compliments and “where did you get that?” reactions. I originally began making these in a class I taught for special needs students, as a way to help them work on small-motor skills. Their projects were given to their moms for Mother’s Day, and I fell in love with the simplistic, whimsical, yet statement look of the bracelets. a zipper…you can buy to fit your wrist, or cut to size, then hand-sew the end of the zipper to keep it from separating. Buttons of various colors, styles, sizes, etc. First, you want to sew the very end of the zipper (closest to the “top” end of the zipper). This will help serve as the opening for which you will secure the other end. Left: small buttons surrounding zipper closure. Right: up-close and personal with the shank button on the far end of the zipper. Second, choose a large shank-type button, and sew it to the opposite end of the zipper. That way, you can loop the top enclosure around it easily, then zip the zipper back up to secure it in place. Next, pick a few small buttons to sew around the top enclosure. It just makes it look nice. Finally, sew on the rest of the buttons…as many, or as few as you would like. It depends upon what look you’re looking for! I have one with a watch face in the center. It’s actually the one I wear most often! Time: I can usually make one bracelet in about an hour or two, depending on how intricate I decide to get. One of the first – and favorites – of my zipper/button bracelet creations! Second Project: Necklace. This one has limitless possibilities. The charm has a fairly large ring attached, allowing enough space to slide onto a variety of chain widths. For my Leia charm, I chose a leather corded rope-style necklace, and added some Boho-looking beads in brass, copper and silver. Voilà…a necklace that you can wear on the “smiling” side for your happy days, and the flip side for those “other” emotions you may be feeling! Sassy or serious? The choice is yours! Last, but certainly not least: earrings! I chose to make the Jyn charms into earrings, specifically so I could wear them with my Musterbrand Jyn Erso jacket, but they would look great with anything you wanted to accessorize! I added a silver heart and fishhook to the charm, and you can see how it hangs length-wise from the ear, and what the back design of the earring looks like as well. My Numbers: Overall, these products receive a 5 out of 5 Galactic Credits rating! They really are made well, are priced well, and shipped very quickly. The possibilities of being creative with the charms are wide-open to experimentation, thereby having the ability to customize to your personal fandom preferences. If you try any of these ideas, or if you come up with some originals of your own, I would love to hear from you, and I’m sure Courtney would love it as well! Tweet out your pictures, and tag me @joycekrebs, as well as Courtney’s Etsy shop @MySquadronGoals. Additional contact information found below! LOVE all this stuff. I’m all about Jyn these days, so I may have to look into that charm….maybe a couple of other things, too. I know you would love the charms… they’re really great! !